Whether you need an annual PSA screening for potential prostate cancer continues to be debated. As an example someone on another prostate cancer website recently indicated he is not against using the test, but questions its inappropriate over-use. Prostate cancer prevention is still a pipe dream in most people's mind. For that matter the prospect of conquering all cancers seems eons a way. I refer to all 200 or more different types of cancers of which prostate cancer is only one. A urologist who recently joined me on a Maine radio show, "Prostate Cancer Health Talk" (see The Designer Health Net Talk Show), expressed his doubts that we would see an end to prostate cancer at any point in our lifetimes. I disagreed, saying I believe this disease will indeed end in our lifetimes ... if we live long enough! Today a founding editor of Med City news, Mary Vanac, reported that Cleveland Clinic immunologist, Dr. Vincent Tuohy has discovered a vaccine that prevents breast cancer in mice. This is extremely exciting and encouraging. Does masturbation prevent prostate cancer if engaged in early in life? That’s highly debatable as a delightful online dialogue between mathematician Tanya Khovanoova and myself illustrates. Can You Prevent Prostate Cancer Surgery by Getting Some Sunshine? Prostate cancer surgery (a radical prostatectomy) and other treatment options wouldn’t be needed, if we could prevent prostate cancer in the first place. Unfortunately there’s no sure-fired method to do that, but we might get off to a good start if we had enough sunshine. Prostate Cancer Prevention: Out with the Old, and in with the New? According to a recent report we are a bit closer to prostate cancer prevention. This is implied by an exhaustive ten year study involving thousands of men, which concluded that heavy coffee drinkers are 60 percent less likely to get prostate cancer. Most forms of prostate cancer treatment are generally effective but can't be used to prevent this disease in the first place. This includes ADT - androgen deprivation therapy to suppress testosterone. Yet some individuals confuse prostate cancer treatment and prevention.This came across recently in some misplaced comments I read on another blog. Its author imparted some accurate comments interspersed with views that misinform rather than enlighten. On these pages I've made prostate cancer treatment my primary concern. But we have to worry about other forms of cancer too. Recently I saw Harry Smith interview Katie Couric on a CBS broadcast. They reviewed how colon screening is so important, in orderto detect possible polyps and the presence of cancer. This should be of concern to all of us no less than prostate cancer. 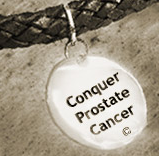 Senator Christopher Dodd (D-Connecticut) appears to be a newly-minted prostate cancer advocate. Two weeks ago he announced he had early-stage prostate cancer and would soon have robotic surgery. After I called one of his senate aides, I surmised that Sen. Dodd's prostatectomy will take place this week. As someone who was in his shoes just over two years ago (medically, only! ), I empathize with him and like most of us, wish him well.